Just a few minutes ago I posted about a custom firmware listing on eBay for Pioneer AVH-4000NEX head units which brings the latest second generation firmware to those head units. Second generation firmware means Google Android Auto gets enabled for the first generation models. Turns out, there is custom firmware available for other head units like the AVIC-8000NEX and AVIC-6000NEX. More details are after the break. Note/Disclaimer: Custom firmware for any electronic device should be installed at your own risk. Often these files can brick or render your device unusable. This posting is only a report and does not encourage installing custom firmware. PROCEED AT YOUR OWN RISK! With the AVIC-6000NEX it is interesting that a firmware file would enable Android Auto since its second generation counterpart, the AVIC-6100NEX, isn't Android Auto capable. But check out this forum thread at AVIC411.com, where user 'Covert_Death' has been working on a working solution to get Android Auto for older head units. 1. Bluetooth Audio does not seem to work after installing the firmware. 2. SiriusXM data has to be reset after updating to get it to work. 3. Some users have reported that CarPlay audio doesn't work either (maybe because it is over Bluetooth too). 4. Your smartphone should be running Android 5.0 Lollipop to be able to use Android Auto. Also, remember that installing custom firmware has its own risks. Please proceed keeping this in mind. Read the entire forum thread to check progress and find out about all existing issues. 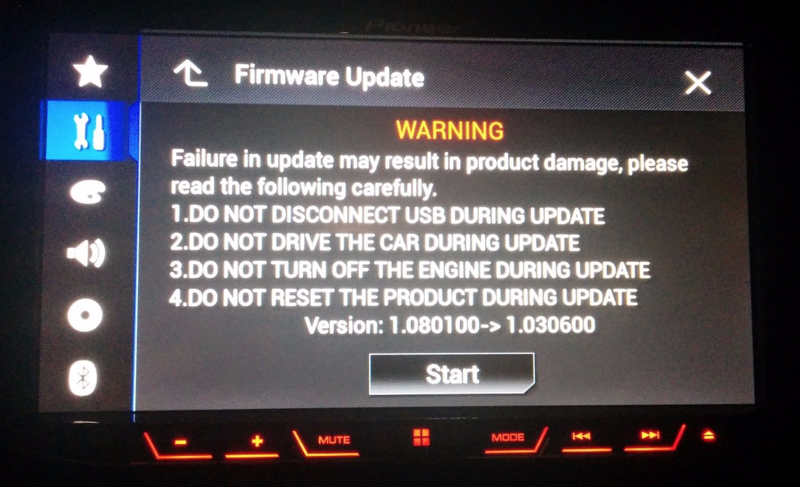 If you aren't sure of any of the risks, you should avoid flashing the firmware and maybe wait for a more stable version. The developer has also included links to downgrade the firmware to the previous version if issues occur or if you can't live without Bluetooth streaming. More on this as further details unfold. Stay tuned.